The Territory Wildlife Park has an extensive system of walking tracks that are well sign posted. Many of the exhibits are located quite closely together, so it is an easy walk between many of them. There are three main walking tracks, which we highly recommend that you visit to appreciate the biodiversity of the Park. 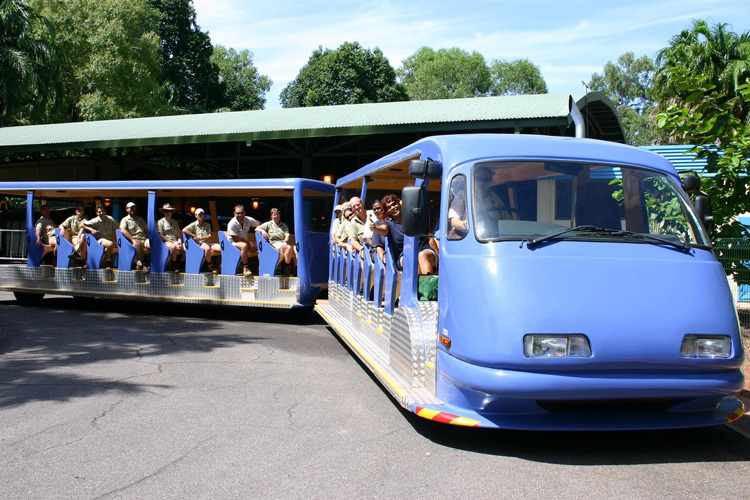 The Woodland Walk covers approximately 600 m, the Wetlands Walk covers 550 m and the Monsoon Forest Walk covers 1100 m.
A free shuttle train runs continuously around the Park's 4 km loop road, picking up and dropping off around the park. First train leaves the main station at 9:30am and every half hour after that, last train of the day is at 4:30pm. There are sheltered pick up points located at the entrance to each exhibit. The shuttle train can accommodate prams/strollers in the first 2 bays of each carriage, and one wheelchair located at the back of the second carriage. Even though we have our shuttle train, you will still be required to walk from the train stations into and through our exhibits. Strollers are available for hire at Admissions. A $5.00 hire fee applies. The Territory Wildlife Park features disabled access parking spaces near the Park’s entrance. All exhibits and restroom facilities have disability access. Guide dogs are permitted at the Territory Wildlife Park. Wheelchairs are available from the Main Station on request.